80 Azimut KOPKAPY is kept undercover in Fort Lauderdale and shows very nice. 730 original hours on main engines. Ready for offers. Call anytime for a scheduled showing. United Yacht Sales New Jersey would love to guide you through a personal showing of this 80' Azimut 80 Carat Flybridge 2006. 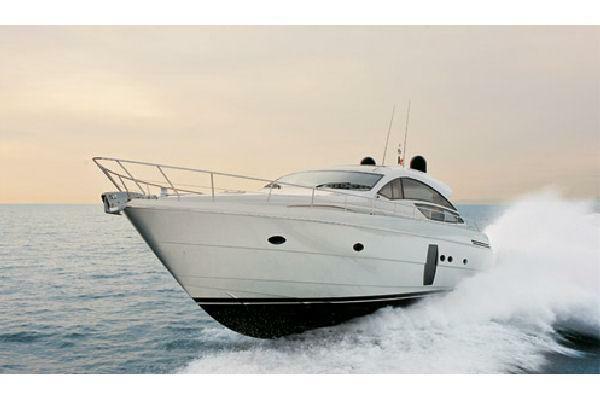 This yacht for sale is located in Fort Lauderdale, Florida and priced at $1,179,000. For a showing please contact us by filling out the form on this page and we will get back to you shortly! The 80' Azimut Carat Flybridge Motor Yacht KOPKAPY is an open and largely informal family yacht, a trait she shares with other models in the Azimut line. Her informality does not imply any lack of quality in her finish, however. Cherry bulkheads, cabinetry and overhead accents are highly detailed, well fitted and finished in high-gloss lacquer that twinkles with clear reflections of recessed overhead lights.The full-beam master is near amidships. The master is separated from the engine room by the crew's quarters. The master has a vanity and a large walk-in locker to port, and a comfortable settee to starboard. The head includes a spacious shower, a bidet and two sinks.VIP guests are accommodated in a bow stateroom with an island queen berth. The remaining four guests occupy two twin-berth cabins, port and starboard between the master and VIP staterooms. Though more compact, the twin cabins are finished and outfitted as nicely as the two main staterooms. For example, the VIP and twin cabins have nearly identical heads: all have circular showers with water outlets overhead that provide the rain-showering equivalent of surround sound. Curved acrylic shower doors rotate out of the way when not in use, allowing extra floor space in front of the toilet and sink.The Carat's dining area in the American version replaces the five outboard chairs with a large banquette. Both have a compact galley to port, facing the table. A beautifully built tambour panel lets the galley remain open as a buffet for informal dinners and cocktail parties. During more formal meals, the panel can be closed for privacy.A lower helm is forward of the galley. Aft, the saloon has fixed seating on two settees facing an entertainment center in the after corner of the room. Like many yachts, the Carat has a power sliding glass door in a glass bulkhead aft, but unlike many other such doors, Azimut's is weather-tight. It includes an innovative system that offsets as it closes, sealing tightly against a gasket.The afterdeck is spacious and fully protected from sun and rain by the extended flying-bridge deck above. Full-length side decks and aft mooring stations with raised capstans, cleats and roller fairleads make docking a snap.A single stairway leads to an integral swim platform. In port or at anchor, a transom door provides entry to the engine room and, through it, access to the crew's quarters. Stern stowage lockers large enough for personal watercraft flank the door.Accessibility in the engine room is good outboard of the engines, excellent in all other areas. Emergency fire dampers on the ventilation ducts and a structural cage around the V-drive shaft, safety features too often omitted.The flying-bridge deck is huge. Even with a tender stowed aft and a large sunpad, there is still plenty of room for socializing. The driver's pod at the centerline helm has enough space for a companion on either side. Abaft it, curved settees flank a small table with what Azimut calls a perimeter leaf. This expands the table by wrapping around, rather than inserting in, the smaller top.In addition to an open aft stair, an innovative alternating-tread wood stair accesses the flying bridge from the galley. Steeper than most stairs to preserve space, it has footpads rather than full-width treads. It is a clever design that has proved safer than inclined ladders in applications afloat and ashore.The Azimut 80 Carat's combination of reliable composite construction, interior and exterior comfort, smart yet subdued styling and excellent performance make her a jewel worthy of consideration. She is suitable for formal or informal entertaining, day-tripping or extended cruising.